Monday August 13th 1900 I put in the entire day sweeping and dusting when not busy with the meals. Will busy about the place and the boys began work on their barn. 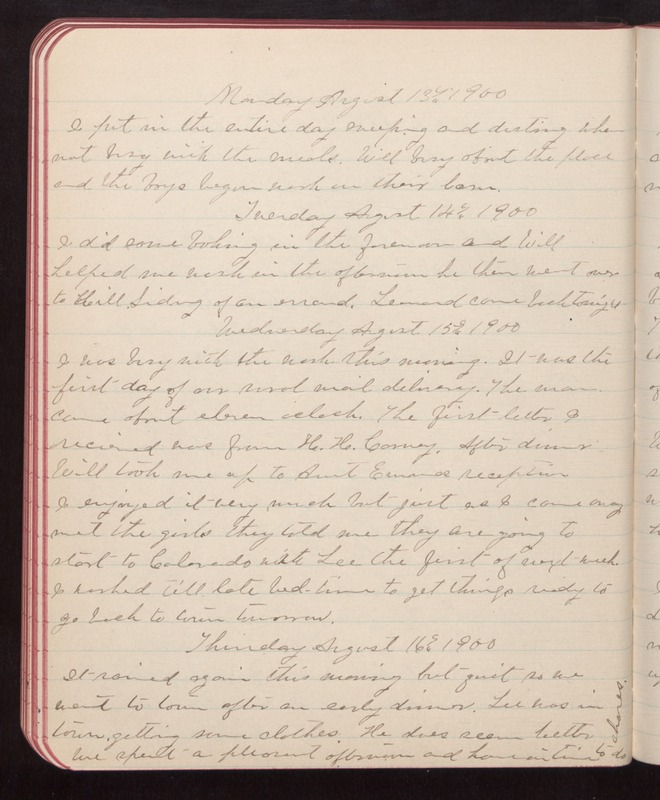 Tuesday August 14th 1900 I did some baking in the forenoon and Will helped me wash in the afternoon he then went over to Hill Siding of an errand. Leonard came back tonight Wednesday August 15th 1900 I was busy with the work this morning. It was the first day of our rural mail delivery. The man came about eleven oclock. The first letter I recieved was from H.H. Carney. After dinner Will took me up to Aunt Emmas reception. I enjoyed it very much but just as I came away met the girls they told me they are going to start to Colorado with Lee the first of next week. I worked till late bed-time to get things ready to go back to town tomorrow. Thursday August 16th 1900 It rained again this morning but quit so we went to town after an early dinner. Lee was in town, getting some clothes. He does seem better We spent a pleasant afternoon and home in time to do chores.